I have a house. I have a house. It is not my house that I have. It is not my house, anymore. I have a house about to tell you. A house about to tell you how. A have now house about me anymore. Let’s talk about that. Let’s talk anymore. Let’s talk dear or do more. Let’s do more that a house will tell us how. That house will ask us, not another. Not another any. Not house another, how. I have it here. I have it, and have my dear, do more. I have a house. Not my house. Not any house. What appears upon first read as breakdown for breakdown’s sake instead establishes a rebellion against the narrowed narrative possibilities of confessional, first person prose. The reader’s expectations change as she is thrust into a moment of urgency and grammatical uncertainty. The narrator wants to tell us about his house, but. If In this alone impulse strives to broaden narrative by dismantling and repurposing language, by seeking out the fundamental core grammar that underpins and generates human want, then it sometimes succeeds. In “Sticky,” the narrator says, “Bored little nones. Spill them speak them. Open like it’s hard to hold it. But hold it. Hold no sliding, hold no slick or stiff.” The trick to grappling with the limits of language is to do so without dissolving into linguistic chaos, a commendable feat that Scanlon struggles to consistently achieve here. His language houses are sturdiest when he adheres to his objects and his obstructions, when his authority pulls the reader through the pinhole or at least points her in the direction of the light. This like we, likely, is this is, undo. Take this out not far but take it widely, so it sits beside us. It should serve as something undid, or else, dust. The intangible central object coupled with obfuscated sentence structure at the outset proves insurmountable, for this reader at least . 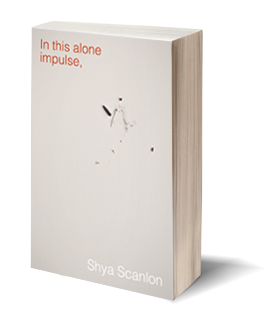 But there is a playfulness to Scanlon’s tone and a real exuberance for the acoustics of words—“This is fire from spinning. From tick and tackle. From rub.”—so that even when the meaning is impossble to glean, the sound still satisfies. For a collection centered on feelings of isolation and disconnection, Scanlon does not shy away from making points of contact with the reader. Direct address and use of the second person provide a sense of inclusion for the reader, a feeling that the she is not so alone after all. “Don’t take me lightly,” one narrator pleads, and in the presence of the lofty goals set forth in In this alone impulse, to do so would be a mistake.